As a full-time hospitality worker, it can be very hard to find the motivation to cook meals every night, never mind worrying about them being healthy and affordable. The thought of having stacks of dishes to clean afterwards makes the idea of going hungry much more appetising. However, I have come up with a few very simple and very easy, quick, healthy and tasty meals that you cannot go wrong with. The best part is that with these recipes, you do not end up with a sink full of dishes! Even for anyone who thinks they can't cook, I promise you, it is not as scary as you think. Not everything is about raw chicken, or having to learn which flavours compliment which textures and all that fuss. All I do is cook things with ingredients that I like! The best thing about all of these dishes is that you can make them your own, you can swap and change ingredients to suit exactly what you like. For example I do not like mushrooms, yet when i'm looking for inspiration, 90% of recipes I like the sound of have mushrooms, if I kept looking until I found one without, then i would have very limited options. So the simple solution is to ignore them, do everything as the recipe says but without that one ingredient. This also goes for preference of pasta, change to gluten free/wholegrain etc. My point is that you can take the main ideas from a recipe and make it completely your own. For any 'first-time' cooks I'm going to put in some very simple instructions, and you can ignore the 'extra hints' that involve a little more effort but to be honest are not necessary if you want to keep it simple. 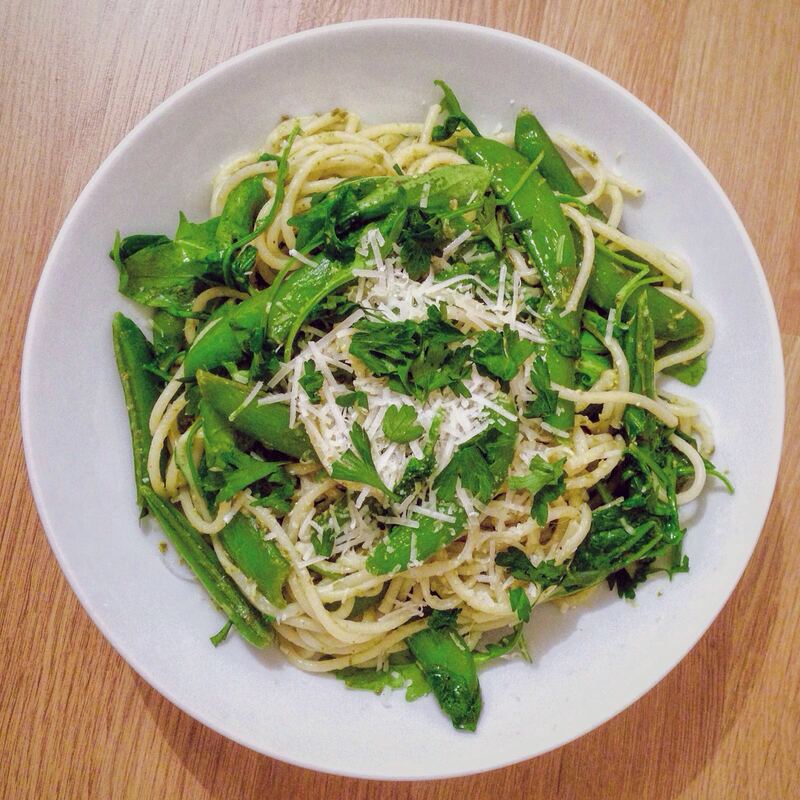 So with this in mind my first recipe is my vegan inspired (not acc vegan as I added Parmesan at the end) Pesto, Rocket and Sugar-snap pea Spaghetti. Just because its a pasta dish it doesn't mean it's unhealthy. This recipe uses only a small amount of pasta and is filled with delicious greens. These ingredients are not expensive and most people have a packet of pasta in the cupboard anyway, you can use as much or as little of each ingredient as you want, its totally up to your own preference. Step 1: Cook the pasta (doesn't have to be spaghetti, use whatever you have in the cupboard to keep the shopping cost low). For first-timers, chuck the pasta in a pan of simmering water, stir it so it doesn't stick together and you know that it's cooked when you try it and it isn't hard... yes its that simple. Extra hint- I put a bit of salt and oil in the water for taste and to prevent the pasta from sticking together. Step 2: Chuck the peas in with the pasta when its almost done. First-timers- the peas are cooked when they are hot and they are nicer when they are still crunchy so about 5 mins will do. Extra hint- peel the edges of the peas down each side so you don't get that stringy stuff in your teeth. Step 3: Drain the pan - literally just tip the water out and hold back the pasta/peas with a spoon or something... who needs a colander (save washing!). Doesn't matter if there's a tiny bit of water in the bottom because that will just add to the sauce. Step 4: The Pesto. First timers- buy a jar of pesto and stir some into the pan over heat. Extra hint- if you want to keep it vegan/nut free etc then make your own by blending any of the following (excluding what you can't have): oil/basil/pine nuts/lemon/garlic/salt/pepper/Parmesan/spinach. Step 5: Stir in some rocket. Extra- add a squeeze of lemon juice, grating of Parmesan, bit of parsley on top and season with salt and pepper. That's it, literally a one pan, delicious and healthy meal in about 15 minutes. 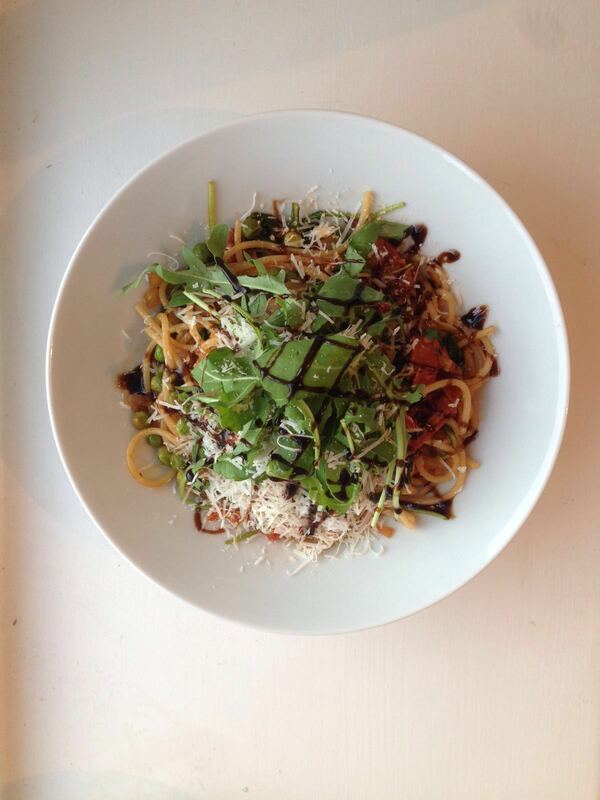 My second dish is a similar idea, Chorizo, Rocket and Balsamic pasta. Step 2: At the same time the pasta is cooking fry the onion in some oil. First timers: put oil in a pan and put thinly chopped onion in it, stir it, if it is soft then its cooked. Step 3: Add chorizo to the onion and fry for a further few minutes. First timers- chorizo doesn't have to be cooked but frying it makes it crispy and brings out the flavour. Extra- add salt/pepper. Step 5: Stir in some rocket and add a drizzle of balsamic glaze. Extra- add a squeeze of lemon juice, grating of Parmesan, top with rocket. My last one, I will admit, requires slightly more effort. 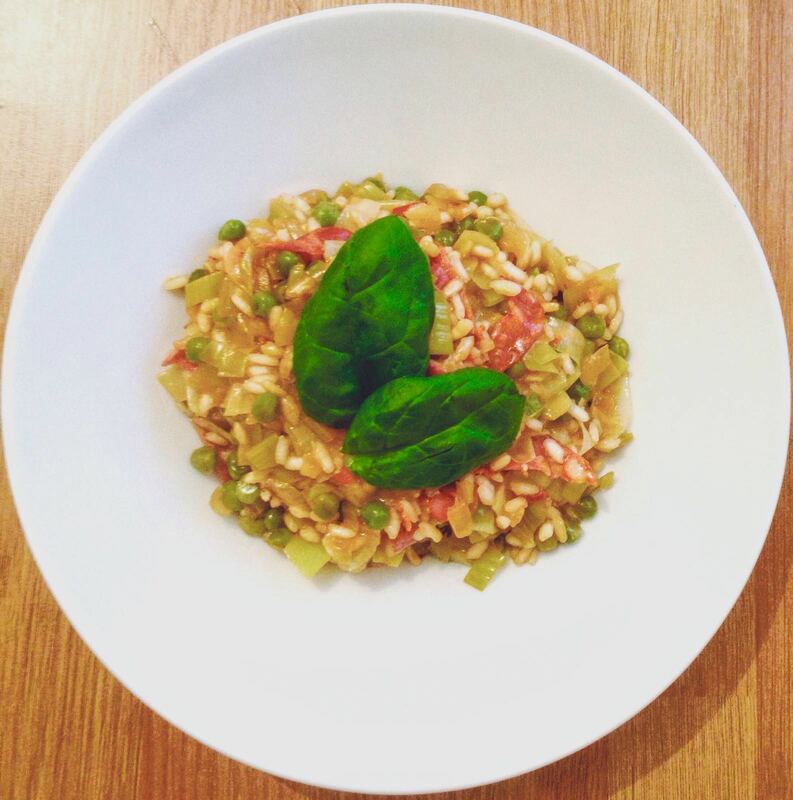 Chorizo and green pea risotto. Step 4: Slowly add the liquid to the pan, a bit at a time, starting with the wine (if you choose to use any) mixing as you go until the rice has absorbed it all. This is a bit of a slow process so just be patient. Extra- add some lemon juice/salt/pepper. Step 5: Mix in the peas a few minutes before serving. Extra: also mix in some parmesan cheese at the end for a bit of extra flavour. So that's my easy and delicious paella style risotto (it would also go really well with some prawns thrown in there). Perfect with a wee garlic flatbread + side-salad. I wouldn't recommend eating pasta 7 nights a week however these three dishes contain ingredients that can be used for so many other things, in salads, soups, as sides and so by picking a few ingredients that you enjoy, you can make them into a week of meals rather than having a load of different ingredients each night that you wont use again. Cooking for one can be expensive but by using the same main ingredients in different ways as I have done here you can save money while eating well at the same time. Loved this post! These recipes were easy to follow while reading and as a student (someone who isn't great at cooking) I feel confident enough that I could make these with little trouble! The risotto dish definitely sounds like my favourite!